As a well-respected, professional, hard-hitting technology journalist, I can appreciate what this kit has to — buwahahahaaaa!! I’m sorry, I couldn’t get though it all. Well-respected! Professional! Journalist! L! O! L! 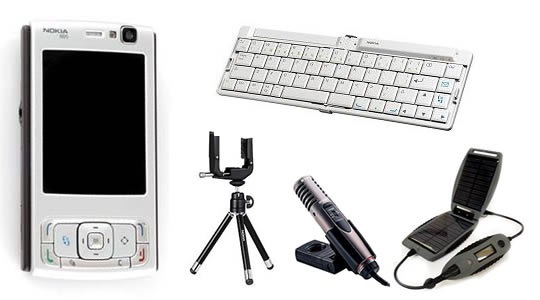 Anyhoo, Reuters came up with an interesting idea to try out with some of its reporters that entailed the use of an entirely mobile setup consisting of a Nokia N95, a Bluetooth keyboard, a tripod, a microphone, and a solar charging accessory. Trials were run during this past summer and stories were posted a special mobile journalism section of Reuters’ main website. The kit may become available to professional journalists like me (buwahahahaaaa!!) and will also be used in another trial involving student journalists at various colleges.